"This Was a Town Without Soul and Full of Memories"
14ymedio, Bertha K. Guillén / Marcelo Hernández, Sandino/Havana, 1 February 2019 — Juan Ramos is 67 years old and does not like to talk about his childhood. Yet, this week his face lit up when he remembered his mother. “If she could have seen this”, he said with reddened eyes. In the town of Sandino, Pinar del Río province — where his whole family was relocated to by force from the Escambray Mountains — the first Catholic church built in Cuba since 1959 has just been inaugurated. “This was a town without soul and full of memories,” Juan assured 14ymedio, while he brushed off a piece of invisible fluff from his shirt. His hands are gnarled from his work sowing tobacco, the most important product in this region where he ended up at only 12 years old. Juan has spent a great part of his life longing for El Pedrero, a town in the province of Sancti Spíritus where he spent his childhood. “Over there I had roosters, a mule with which I wandered through the mountain and, in the backyard of my house, a small cemetery with all of the dogs that my family had owned”, he remembers now. “We used to go to town on Sundays to attend Mass and, from time to time, a priest would visit us. But one day the militiamen arrived and the only thing we could only carry with us was the very clothes we had on”, he says. To prevent peasants and farmers in the area from supplying food and assistance to the “uprising” of the Escambray, a group of rebels that hoped to overthrow Fidel Castro in the beginning of the 1960s, the revolutionary government ordered for the residents of those mountains in the center of the island to be removed indiscriminately. Juan and his family among those expelled in 1964 and were taken to captive towns, or communities in which one could hardly leave or enter. According to personal details revealed in publications of the Cuban exile community, it is estimated that a total of 21 towns were erected in this way, surrounded by wired fences and permanent guards at the entrance. Residents could neither get out nor receive visitors, and all of the correspondence was inspected. “We were escorted by armed militiamen the whole trip and when we got here my parents were very sad because it was an ugly place, real ugly”, Juan notes. “Homes resembling matchboxes were starting to be built, all very close to one another. You could not go out into the open fields and there was no church”. Among the things his family could safeguard during their forced relocation was a wooden cross that Juan’s mother wore on a necklace. “That was our very own church for decades. Every night we would take it out and would light a candle for it”, he describes. “We had to be careful when doing it because this town was full of informants”. His brother managed to get out when the mass exodus took place from the port of Mariel in 1980 but Juan stayed. Last Sunday, Juan was one of the many parishioners that filled the church in Sandino during the Mass. The temple was erected thanks, in part, to funds donated by worshippers of the Church of San Lorenzo in Tampa, Florida, itself built by the Cuban exile community which contributed 95,000 dollars to the building’s construction. 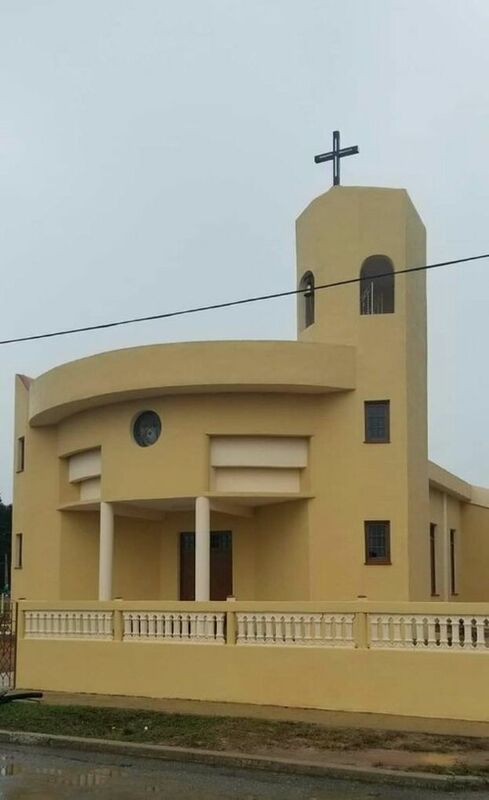 The construction of two more churches has been authorized, following the normalization of relations between the Vatican and the Government of Cuba in recent decades. “We feel so much happiness that it is impossible to describe. Just as the bishop said, a church for a Christian is like a hospital for the sickly,” recounted Rosa Martínez, one of the residents who attended the ceremony. “The tears were pouring from my eyes when I saw my church gathered in that long awaited temple”, she said, interrupting herself with a sigh. “In all of the years that I have lived here I have never seen so many people gathered together”, Martínez commented. She lived through times when “everyone suspected each other and were afraid to talk about these things”. People from all over the Western part of the country came for the opening ceremony despite the bad weather. The celebration was charged with emotive moments and some volunteers even transmitted the event live through the internet to their relatives outside of Cuba. “The Mexican women of the congregation of the Little Sisters have done very important work in this community”, says Idania, an octogenarian who took flowers to the Virgin of Charity’s altar located in the new church. 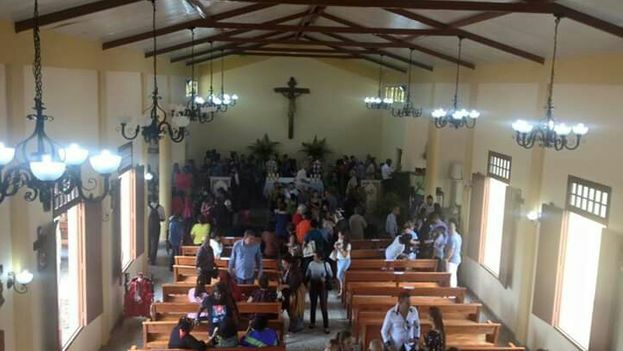 She prefers to not talk of the past, and a wince of pain appears when asked if the church belongs to the residents that were relocated from the Escambray. Rather, she prefers to concentrate “on the present, on the now”.